Southern California beach areas are bracing for the imminent arrival of summer, when landlocked Angelenos and tourists alike seek reprieve from the inland heat and smog. 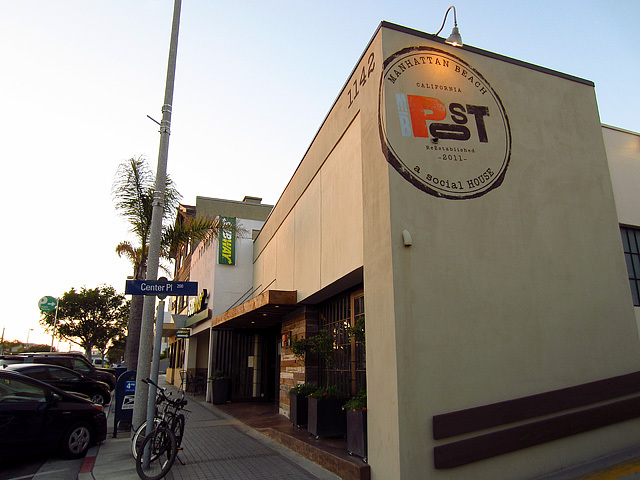 Manhattan Beach in particular should prepare for an influx of visitors that will likely continue well beyond Labor Day, as word gets out about Manhattan Beach Post (MB Post), now open in the space that formerly housed Memphis at the Beach. Chef and co-owner David LeFevre invites guests into his “social house” to explore rustic, refined dishes that are created to be shared. The highly personal menu touches on various points of LeFevre’s career, from his years with mentor Charlie Trotter, his time in some of the great kitchens of France, and his six-year stint at Water Grill. 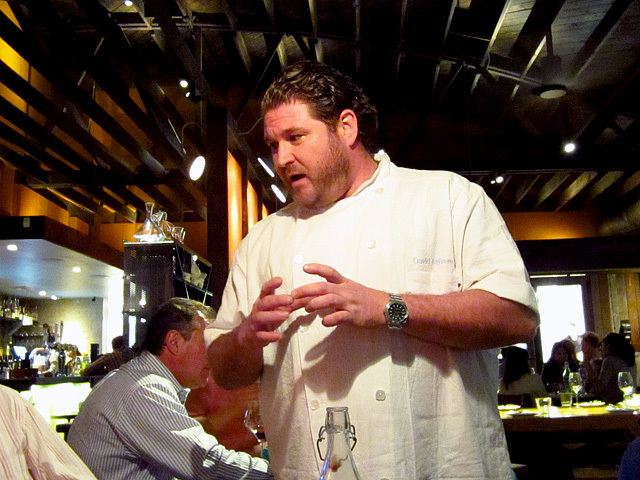 In 2002, LeFevre embarked on a two-year exploration of the cuisines of Southeast Asia, Japan, Australia, the Caribbean, and Europe, a culinary odyssey that also informs much of his MB Post menu. LeFevre has been a Manhattan Beach resident for six years, and MB Post represents his vision of a warm and welcoming gathering place for the beach community. I had arrived early for a recent media dinner at MB Post, so along with fellow early bird The Savory Hunter, I headed to the bar to say hello to Beau du Bois, whom I first met at RH at the Andaz. The bar was slammed so he didn’t have time to chat, but du Bois did offer to get us started with cocktails. In the meantime, we took in the bustling scene. Seated in booths and communal tables beneath the bow truss ceiling, the dinner crowd was engaged in lively conversation and eagerly passed plates back and forth. We could see through the windows behind us and look into the open kitchen, where LeFevre was directing his team. The MB Post cocktail menu is a collaboration between GM Jerry Garbus and the MB Post mixologists: du Bois, Greg Westcott and Sal Roses. 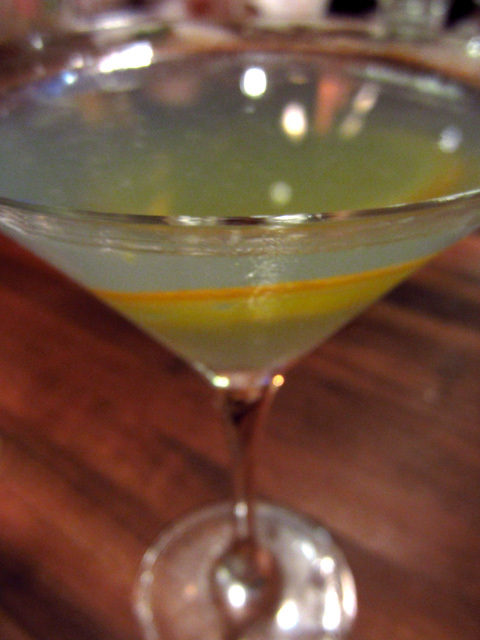 According to Garbus, while LeFevre “wasn’t behind the bar mixing drinks, his influence [on the cocktail menu] was profound. Chef David’s mastery of flavor combinations and profiles and integration of culinary techniques was instrumental in the process.” MB Post also offers five beers on draught and twelve bottled beers. 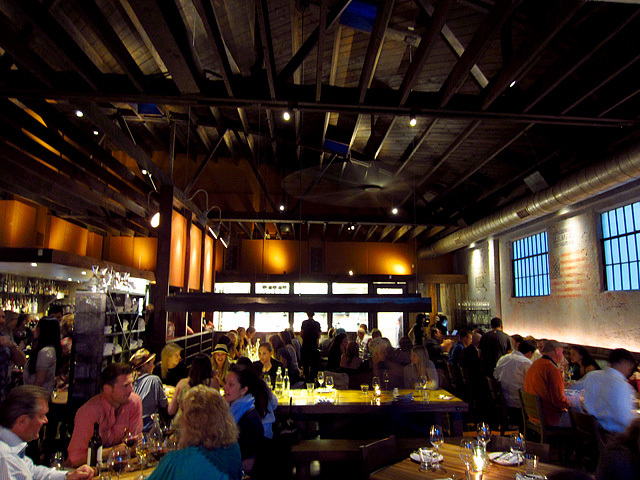 Thirty wines by the glass and a 100-bottle list showcase esoteric, small production wines. Priced at $12 each, MB Post’s ten signature cocktails are revamps of classic drinks. I naturally began with the Manhattan Avenue: Sazerac rye whiskey, Vya sweet vermouth, and a sea salt caramel – vanilla bitters. 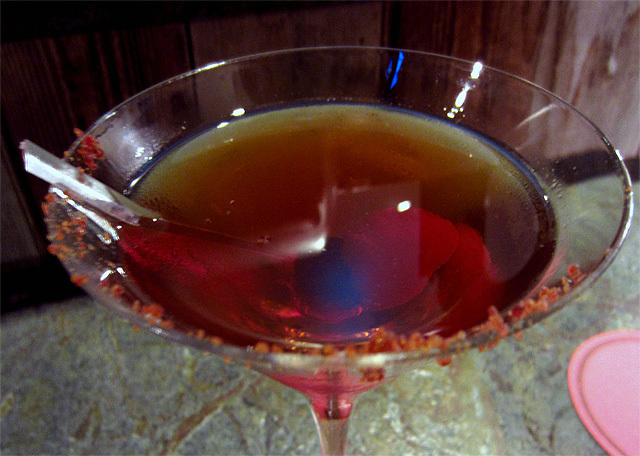 The Manhattan Avenue is served up in a cocktail glass partially rimmed in bacon “dust” and garnished with a Scotch-soaked cherry and flamed orange peel. At first I thought the MB Post variation would be overwhelmed by the ingredients, especially the bacon. I didn’t taste much of the bacon on the rim, so the Manhattan Avenue was subtle and balanced, with the spicy rye given a sweet depth from the bitters. 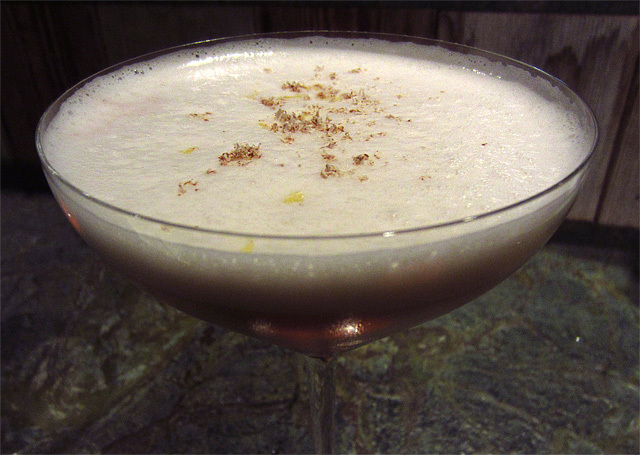 Aaron went with a Festering Borough: Eagle Rare Bourbon, lemon, cinnamon, framboise and egg. An interesting take on the New York Sour (itself a variation of the Whiskey Sour), with the framboise subbing for the traditional red wine float. 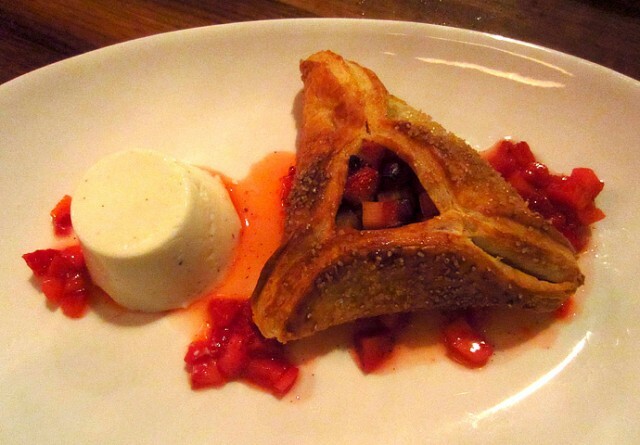 The rich and sweet Festering Borough would be a good pairing with a dessert course or after dinner. This first round exemplified the MB Post approach to its cocktails: inspired by classics that have been updated and remixed with fresh, seasonal and artisan ingredients. Du Bois would tell me later that this opening menu is their introduction to the neighborhood, striking a balance between mixology and flavor profiles that appeal to the SoCal beach clientele and setting. Going forward, the cocktail menus will change seasonally and once they’re established, the team will stretch its creative muscles further. Concrete walls are softened by reclaimed barn wood and accented by planks that evoke the nearby pier and lifeguard stands. On the facade, steel and glass sliding doors (closed the night of our dinner) add to the restaurant’s inviting atmosphere by transforming the dining room into an indoor-outdoor space. 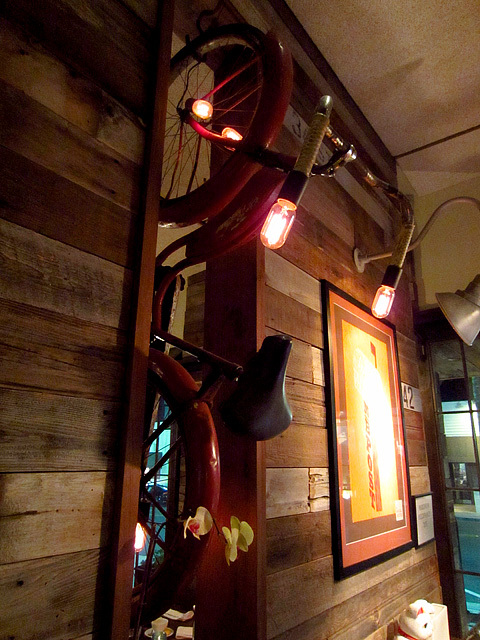 Whimsical design elements extend the post office motif: near the entrance, a vintage bicycle is re-purposed as a light fixture; mail slots serve as a room divider; a Manhattan Beach postal “stamp” decorates a dining room wall. The postal theme was even carried through to our reserved table, where we found an envelope with printouts of the menu, including LeFevre’s handwritten daily specials featuring his farmers market finds. Our hosted meal didn’t unfold as distinct courses so much as waves of food arrived at our table, timed so we could catch our breath before the next round arrived. The generous portions weren’t just for our benefit; as mentioned above, the plates are meant to be shared and we were getting “regular” sized servings. We started by taking the menu’s advice to “Eat Your Vegetables”: Salt Roasted Baby Beets with Drake Family Farms chevre, pistachio and beet green pesto ($9), and Pomegranate Cous Cous with lavender feta, marcona almonds and mint ($9). 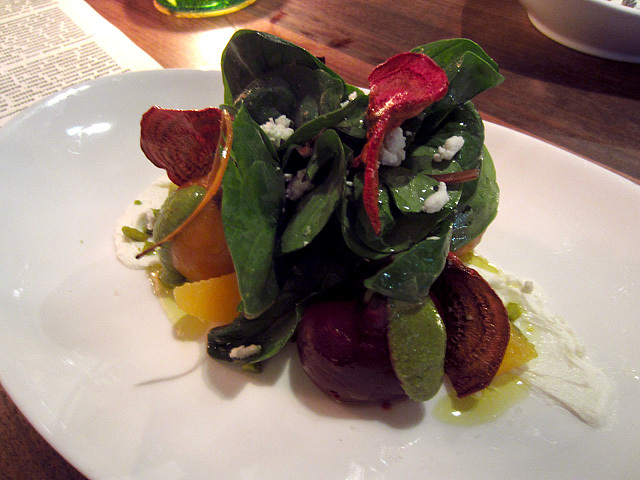 Both dishes were excellent; the beets in particular were a standout. 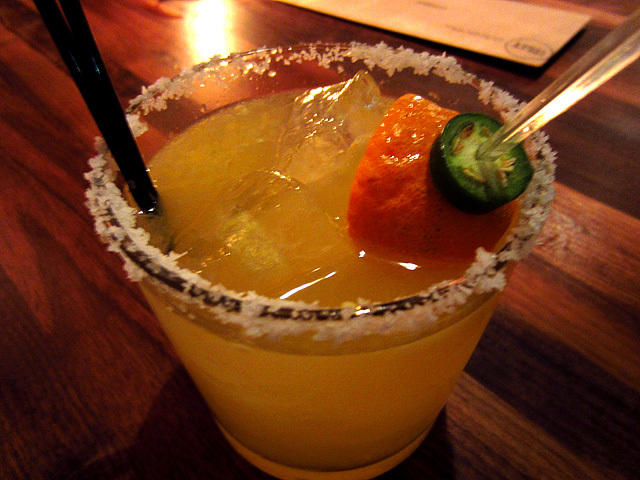 I took a sip of an Avila’s Heir, a Margarita variation with Corralejo Reposado, serrano pepper, mandarin orange and yuzu-infused agave nectar. The Avila’s Heir was a great example of the MB Post style, citrus forward with plenty of lingering heat. 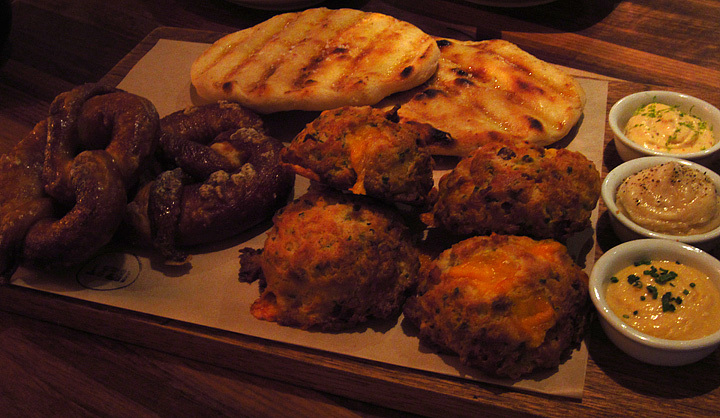 Fleur de Sel Pretzels, Grilled Naan Flatbread, Bacon Cheddar Buttermilk Biscuits. Next came the “Pass the Breads”: Bacon Cheddar Buttermilk Biscuits with maple butter ($5), Fleur de Sel Pretzels with horseradish mustard ($4), and Grilled Naan Flatbread with harissa yogurt ($4). The biscuits are wonderfully addictive, especially after they’re slathered in Vermont’s finest. 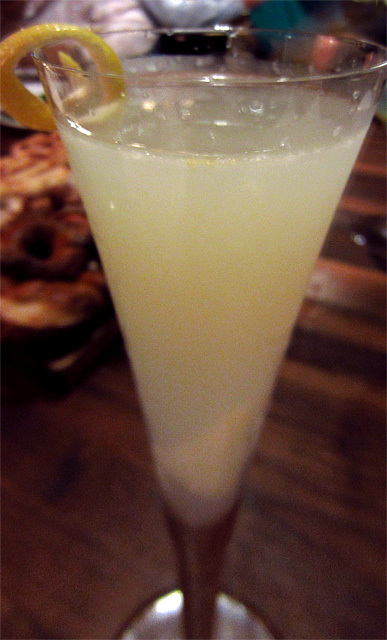 My second round was the Dirge: Corpse Reviver, a version of the classic “hair of the dog” cocktail made with Old Raj Gin, Lillet, lemon and absinthe. The Dirge was my favorite cocktail of the tasting, balanced between the distinct Old Raj, citrus and tart flavors, with a hint of anise. Fiona (Gourmet Pigs) had the Landing Strip, a relatively straightforward Aviation made with Hendrick’s Gin, Crème de Violette and candied orange. The funky, floral violet liqueur gives the classic cocktail its sky blue color and its name, but at MB Post it’s a reminder that the Pacific Ocean is just a short walk away. 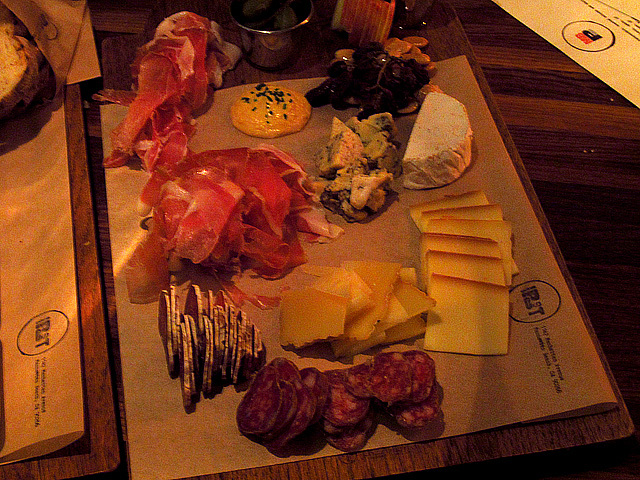 A selection of Cheeses and Cured Meats arrived, including the superb La Quercia Organic Prosciutto ($12) as well as two varieties of Creminelli Artisan Salami: Piccante and Casalingo ($10 each). To go with the house-made grilled bread, we were presented “A Lil’ Sumin’ Sumin’” assortment of pickles, marinated olives, honey, house-made mustards, and fruit spreads. I would have been content to sip on the Dirge and sample charcuterie, cheese and bread, but fortunately the seafood and meat dishes were still to come. 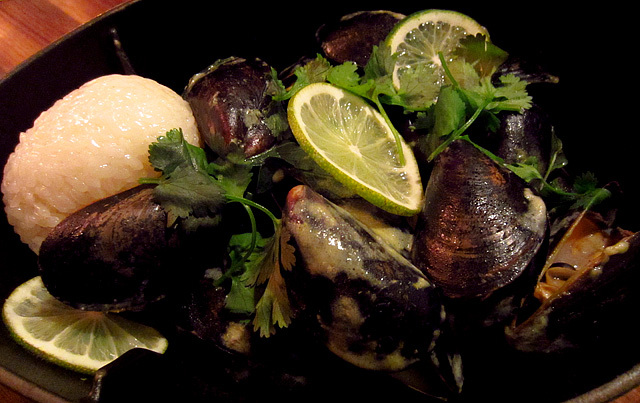 Two “Seafood…Eat Food” dishes were my favorites of the night, beginning with the delicious Steamed Mussels in green curry with Vietnamese sausage and sticky rice ($14). I had to remind myself to share so I wouldn’t keep digging into the generous helping of mussels. 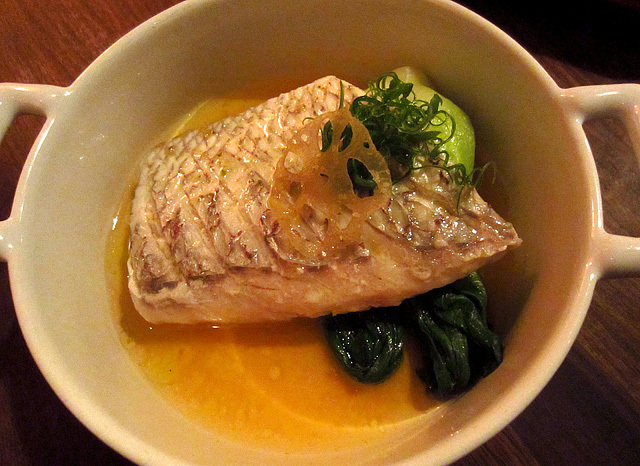 Another highlight was one of the specials, the Steamed Tai Snapper with Bok Choy and Sudachi ($15). The fish was light, tender and flavorful; if only I had more than a couple of tantalizing bites. 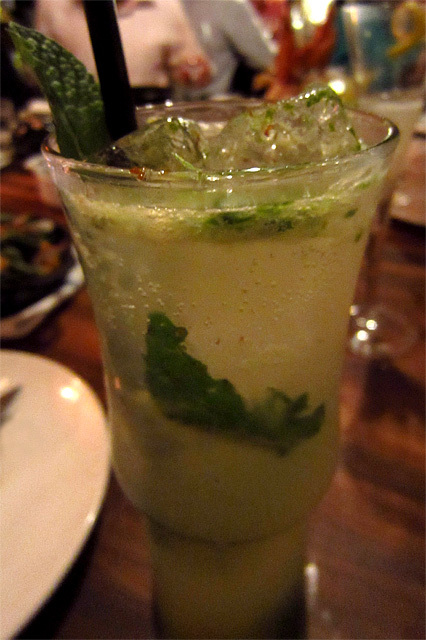 To pair with this round, I had the Mo-Pho-Jito: Starr African Rum, kaffir lime, mint, ginger and a coriander-honey gastrique. Though I didn’t really get much of the Southeast Asian flavors promised in the ingredients list, it’s a fine mojito and a bright, refreshing sipper that’s ready-made for the summer. It’s also the perfect cocktail to enjoy with the seafood. 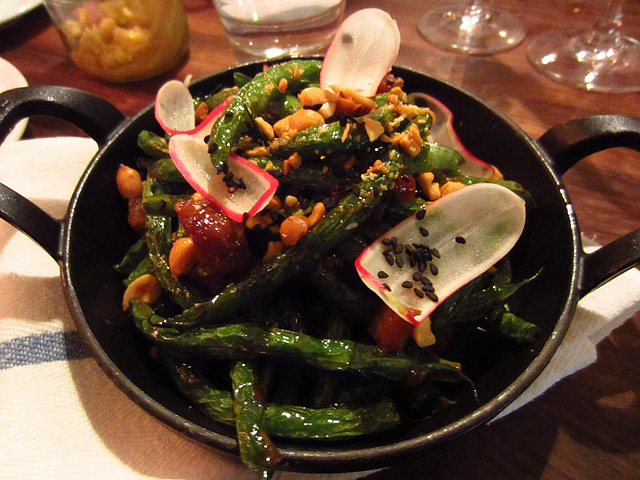 The top vegetable dish was the Blistering Chinese Long Beans with Thai basil, chili sauce and crispy pork ($9). The beans were likewise crisp, with a savory heat that reminded me of the green beans in XO sauce you’d find in a Chinese restaurant, minus the dried seafood. The Fee Fi Fo Fries with MBP fry sauce ($6) are superb, truly ginormous fries that are perfectly crisp on the outside, hot and fluffy on the inside. The next time I have these I’m going to park myself at the bar and wash them down with a Mirror Pond Pale Ale. And the hits kept on coming, with a handwritten “Meat Me Later” item leading the way: ¡Albóndigas! 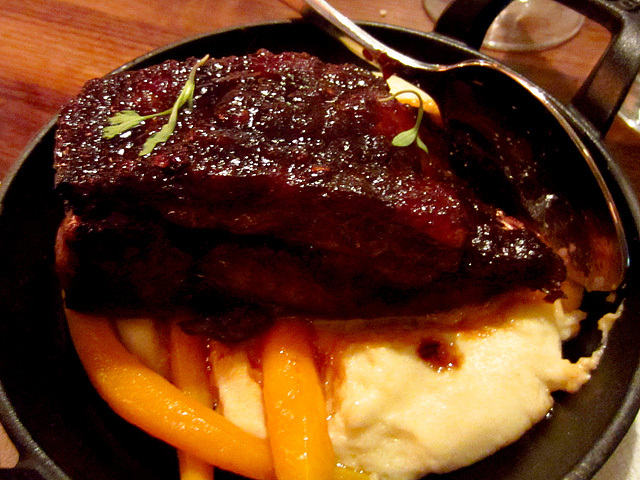 with garnet yam puree, shishitos, maple-miso glaze ($11). 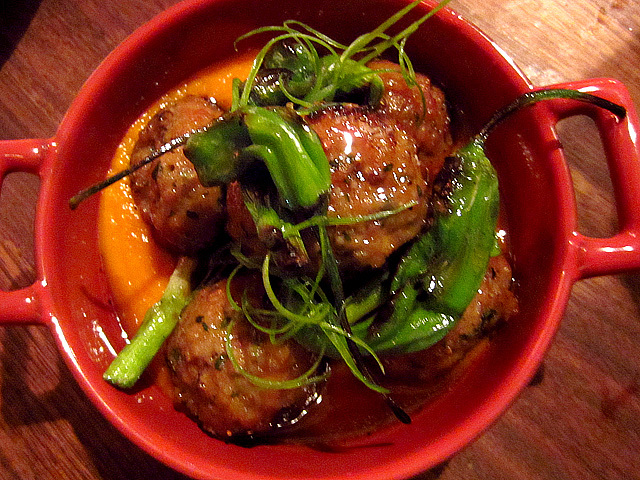 The Spanish meatballs were excellent, with a hint of sweetness and a nice accompaniment in the yam and mild Japanese peppers. 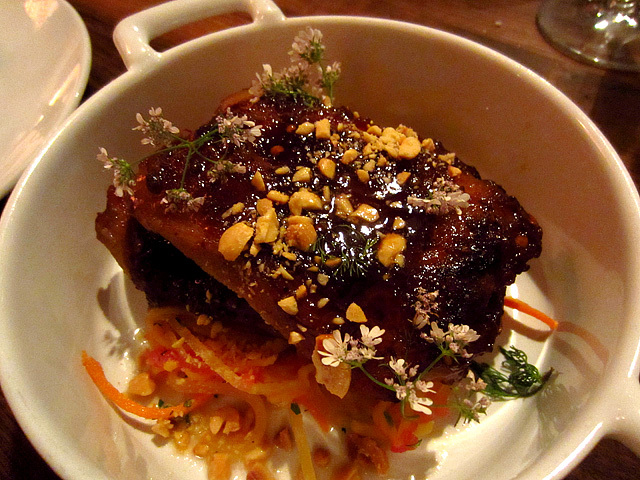 Two unctuous proteins followed: the Vietnamese Caramel Pork Jowl and the Moroccan BBQ Lamb Belly. Of these two uncommon cuts, the lamb belly is more successful, the rich and fatty meat offset by the bed of porridge-like semolina. The pork jowl was too sweet for me, though like the lamb belly it has a nice, fatty texture. 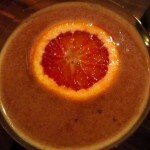 The bar sent over a Sun Also Rises, made with Compass Box Oak Cross, rhubarb and blood orange. 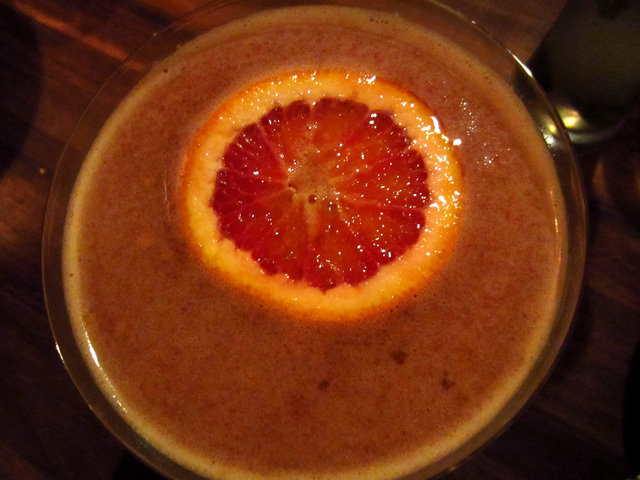 The Blood and Sand is given a sweet twist, with tart and citrus notes anchored by the soft and smoky blended Scotch. 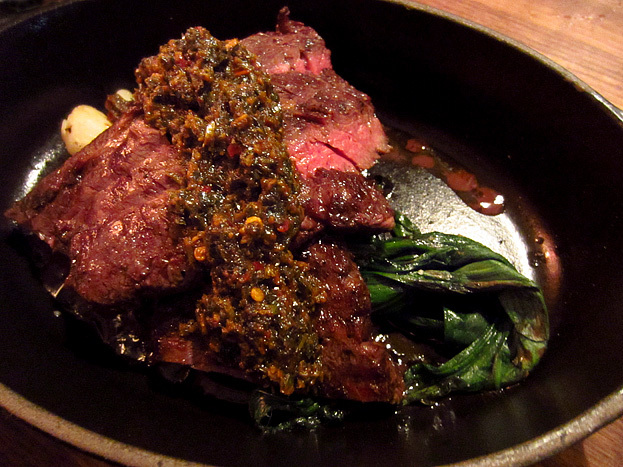 I don’t know if du Bois knew the “Never Ever” Skirt Steak had just been served, but it paired well with the tender steak and earthy chimichurri. 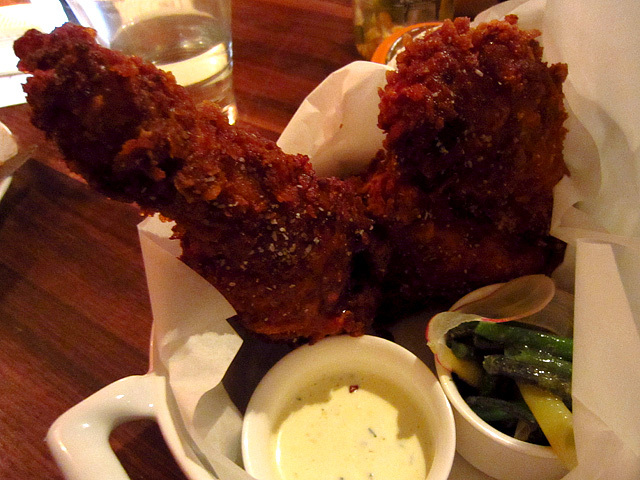 The Buttermilk Marinated Organic Fried Chicken Leg and Thigh ($12) has everything you want in fried chicken: moist and tender meat, crispy skin, and a nice lemon and rosemary ranch dressing for dipping. I just wish there was more of it to share. I always say that I don’t have a sweet tooth, and then I taste desserts like those from “A Spoon Full of Sugar” and that theory goes out the window. 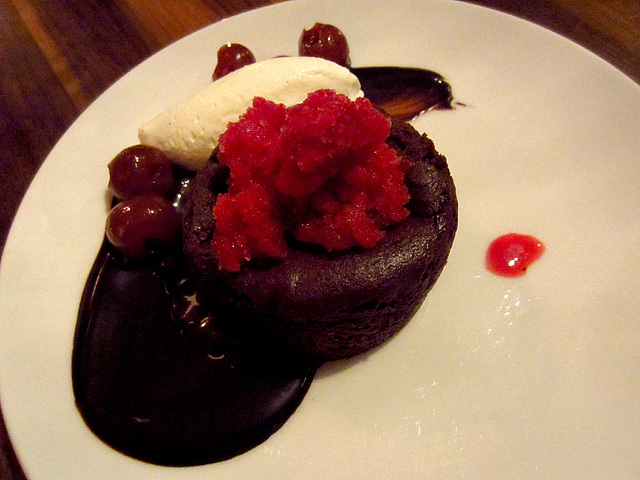 The Chocolate Cherry Pudding Cake and the Three Point Tart were both memorable for their fruit, the former a subtle creation with cherries two ways, the latter with its fruit filling in a flaky crust. If the packed house the night of our dinner was any indication, Manhattan Beach has already welcomed MB Post with open arms. And well it should: residents can now stay local to enjoy reasonably-priced, sophisticated cuisine and craft cocktails in a sleek and comfortable space. 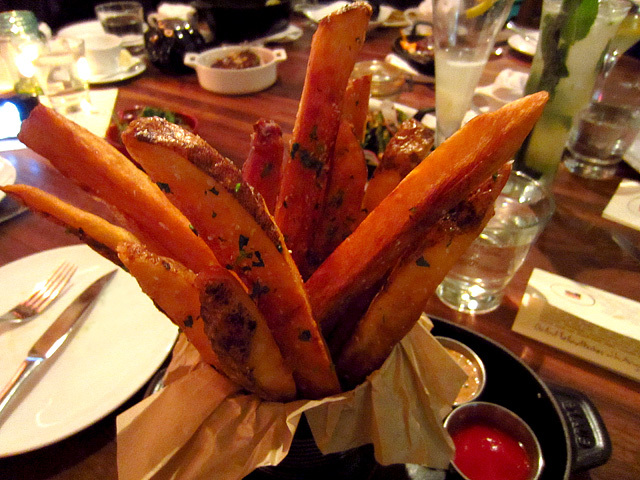 MB Post is open for dinner 5pm-10pm Sunday through Thursday, and 5pm-11pm Friday and Saturday. More MB Post photos in the Flickr album.